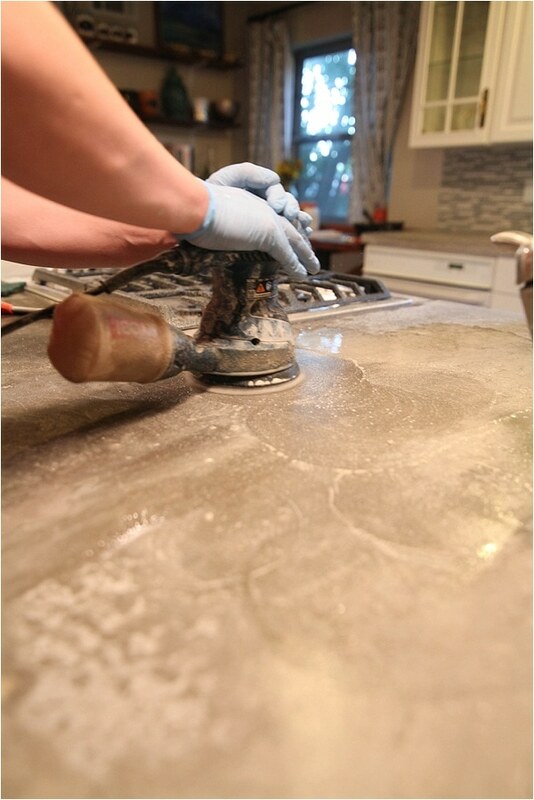 The number one thing people ask me about in our house is our concrete countertops. We built, installed and sealed them ourselves almost two years ago. When people ask us why we went with concrete, we always tell them a fun little story that I mentioned in this post here, but now the story is even more fun. Check out how small this world actually is! Scott and I were on vacation in Asheville, NC the week before we were supposed to close on our house. We were doing lots of exciting day dreaming and planning and looking for ideas and inspiration absolutely everywhere. We had been debating about countertop ideas and found ourselves at lunch at this awesome place called Corner Kitchen. 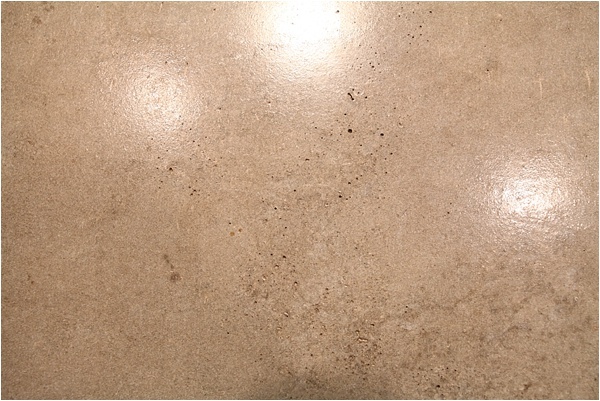 We sat at a bar that had this amazing thick, gorgeous concrete countertop and we were sold on the idea. Fast forward to this summer. Scott and I went to Atlanta for a diy blogger conference and were chatting with Jeremy from Buddy Rhodes concrete during some downtime. 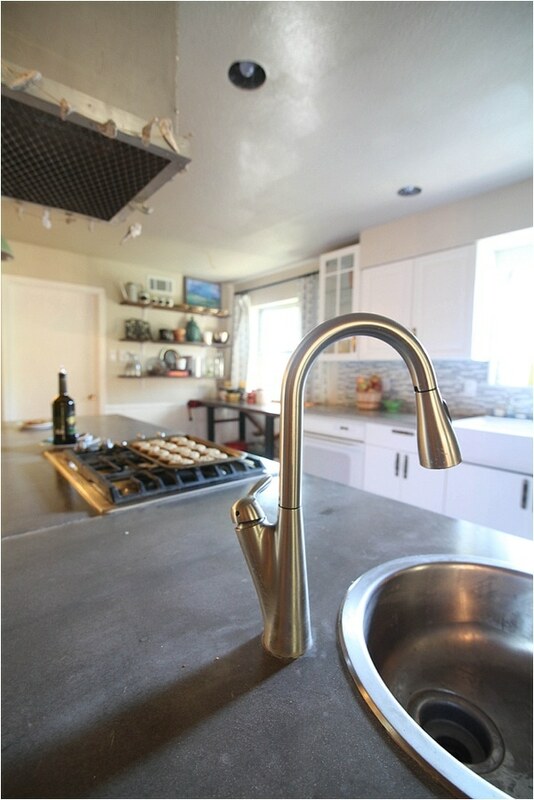 He asked about my blog, I told him we did concrete countertops, he said I looked familiar and we figured out he had seen our concrete countertop post. So cool right? Wait, what????? How random and cool. So needless to say we formed a fun connection and when Jeremy told us he would be in Dallas for a conference and wouldn’t mind coming by to help us with resealing our countertops, we were super excited. You see, our countertops had started developing stains. 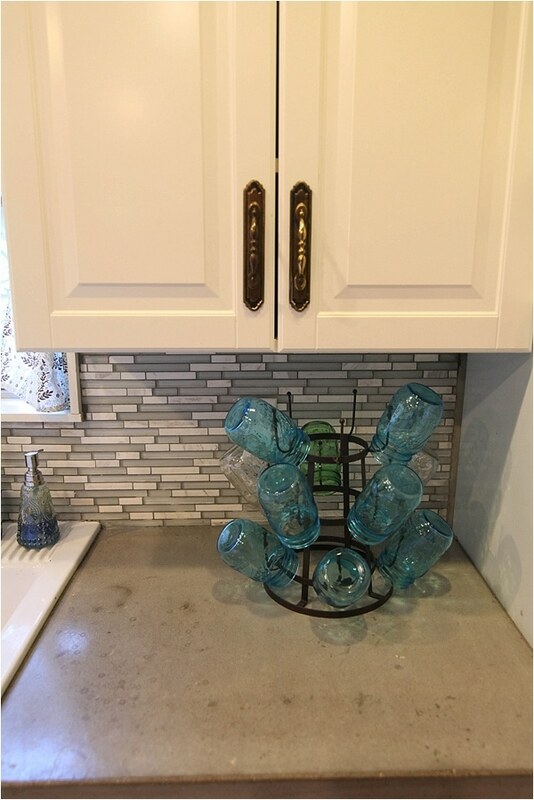 Even though we were fairly faithful with resealing them every 6 months, we couldn’t leave water or any liquid on our countertop for any amount of time without a stain appearing. Not very practical for a kitchen. 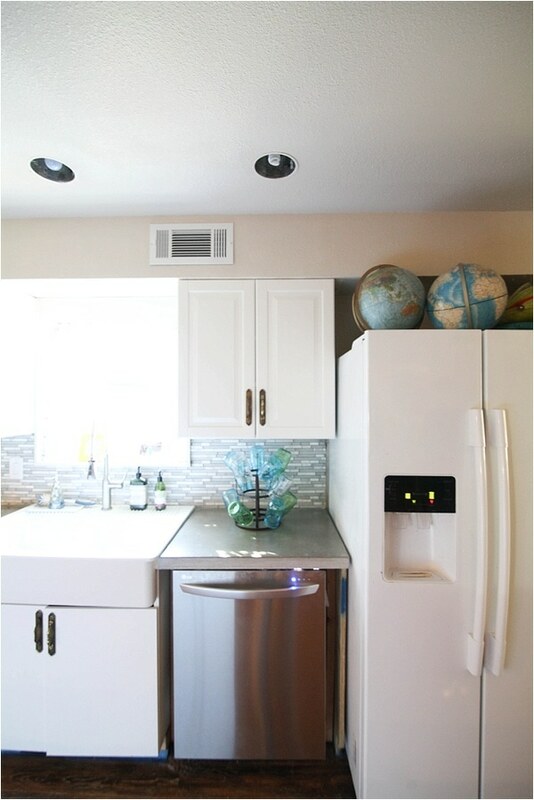 Additionally, the countertops had gone from a dark gray to a strange cloudy gray that I wasn’t loving. Never fear though, Jeremy had a plan—we had to remove the old, ineffective sealer and reseal with a better one. I won’t lie to you guys—it was messy and a lot of work. But (spoiler!) totally worth it!!! We started by removing the old sealer off. To prep the area we cleaned it and used tape around the edges to try and keep the water from splashing on the floor. Then, we sanded using Buddy Rhodes Diamond Hand Polishing Pads and Buddy Rhodes Diamond Polishing Pads with a random orbital sander. 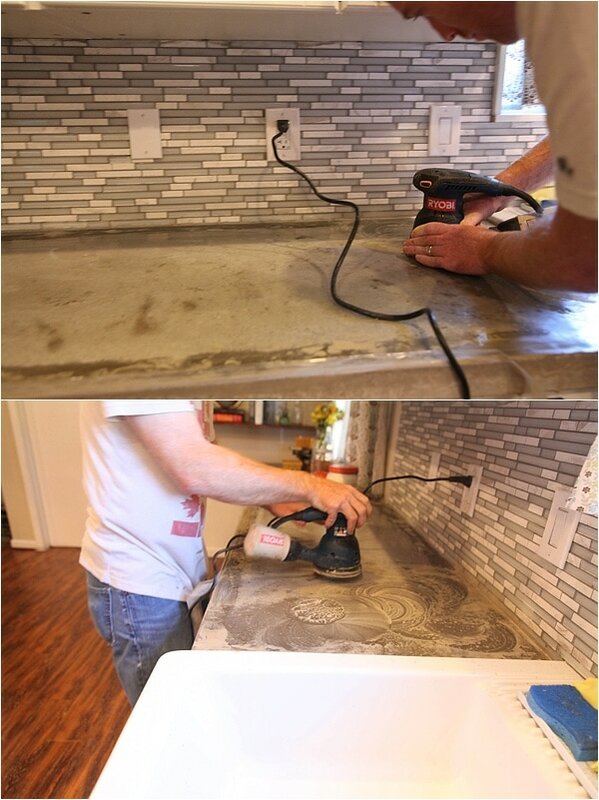 To do this you need to add lots of water to your countertops—sand wet! This is the messy part—be prepared for mud to fly around everywhere (it cleans off easy though!). After sanding, Jeremy pointed out the root issue of our countertop stains. We had tiny little holes in the concrete that were retaining the stain and water. To fix this we did a skim coat using unsanded tile grout and water. 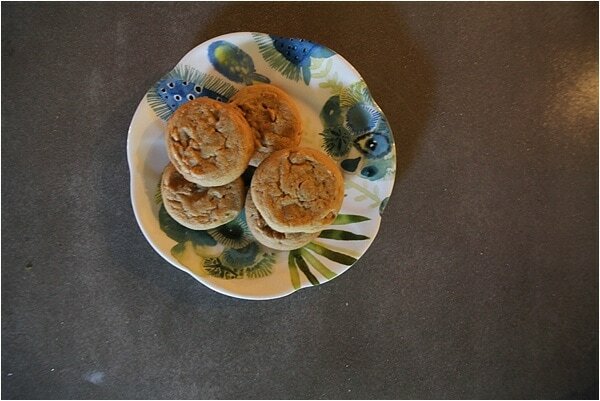 Simply mix them together then apply a thin coat to the countertop surface. We used a putty knife to make sure the holes were filled and then wiped the excess off the counters. At this point, we allowed them to sit and dry for 24 hours. Scott and I picked up with the counters the following day and used the wet sanding technique with the diamond pads to lightly sand the countertops down so they were flat and smooth. 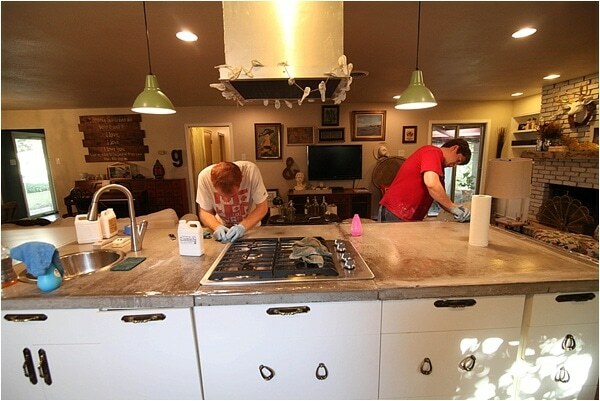 We then allowed our countertops to dry for another 24 hours. Once we had the bare, dry concrete with all the old sealer removed and the skim coat smoothed, it was time to prep the counters for the new sealer. 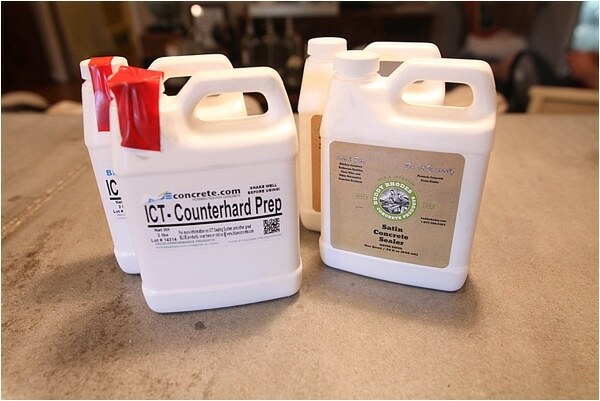 We used ICT Counterhard Prep. 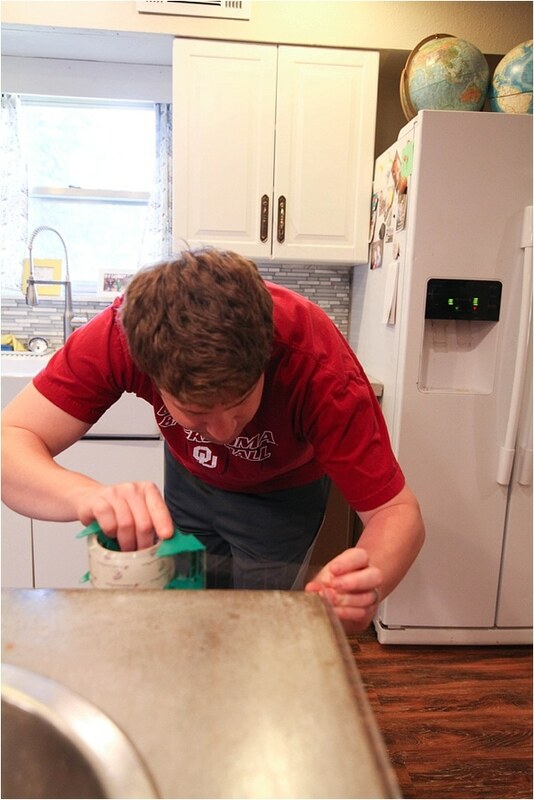 To apply, we mixed a 1:1 ratio of water to the Counterhard Prep and applied using a slightly damp microfiber cloth. It’s important to keep a wet edge and to make big circular or S-shaped motions so the surface is evenly covered. After the first coat, wait 20 minutes and then do a second with the 1:1 ratio again. 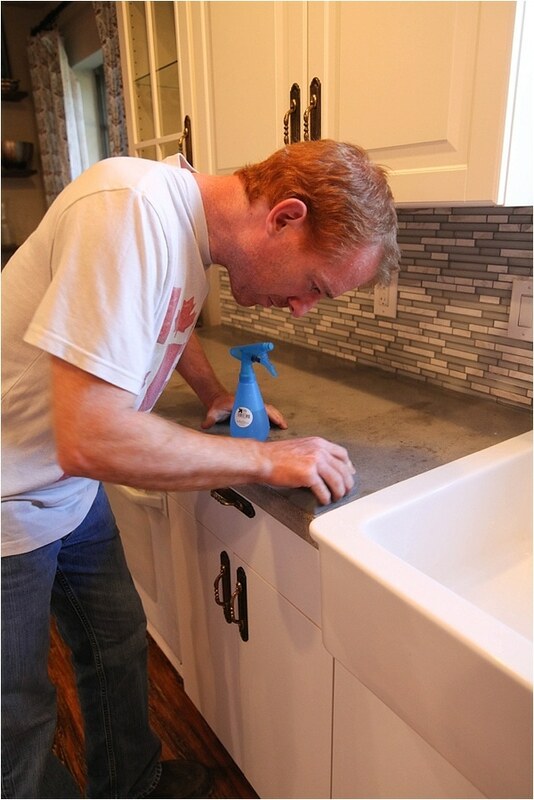 After drying for 20 minutes you can then apply 2 coats of full Counterhard, each 20 minutes apart. 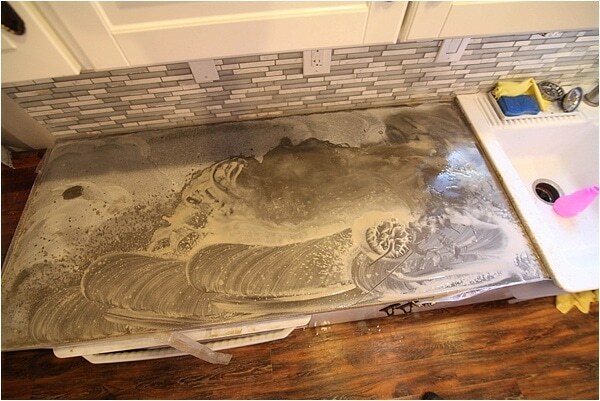 Then we let the countertops dry for another 24 hours. I told you all this was a long process! Finally, we were ready to add the final piece—the actual sealer! We used Buddy Rhodes’ Satin Concrete Sealer and again applied it using a microfiber cloth making big swooping s-shaped patterns. We did 5 coats, with 20-30 minutes of dry time in between each one. Then we let the counters dry overnight. The next morning we did the water drop test. You basically put a few drops of water on various spots for 30 seconds and see if they leave a dark spot. If they do, you need to continue adding a few more layers of sealer. If not, they are done! We had one counter area that needed 2 additional layers of sealer, but everywhere else passed the drop test. I’m happy to report that several weeks later there is no sign of staining and our cups no longer leave water rings on our countertops. 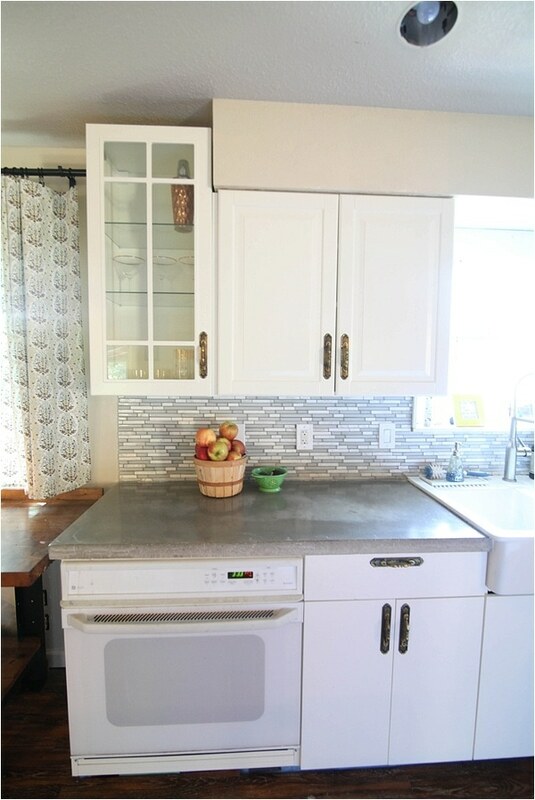 The countertops are restored to their original rich gray color. We are so happy with how gorgeous they look and how glossy they feel! Totally worth all the time and effort. We have to give a huge thank you to Jeremy for all his help, and to Buddy Rhodes for supplying all the products we needed! 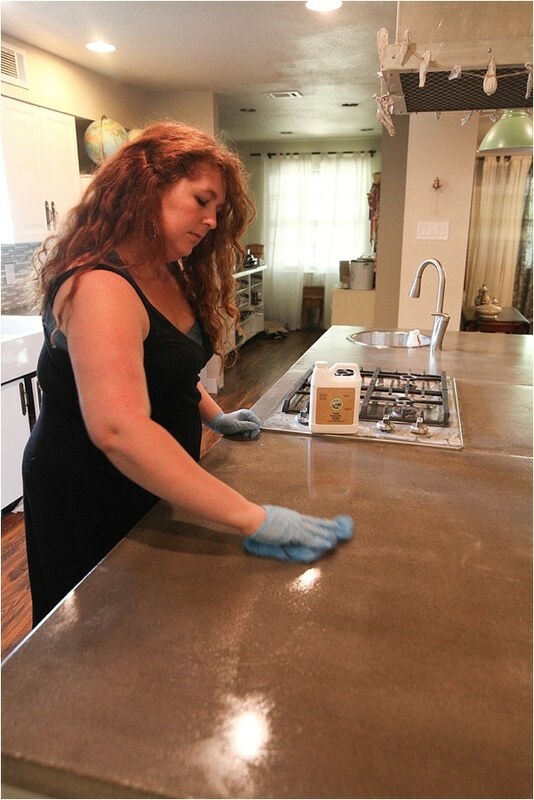 If you are even considering concrete countertops check them out! The products were provided to me free of cost, but my feedback is (as always!) 100% my own. Thanks Jenn! Isn’t that crazy? What an awesome story!!! 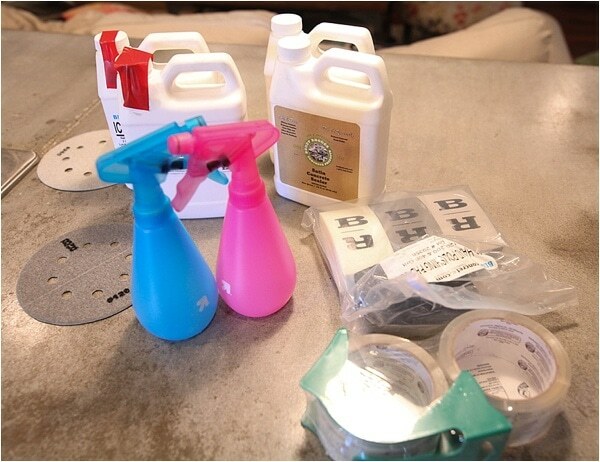 And I love that you shared a followup about your initial DIY project – I feel that bloggers don’t often update with how something is really holding up. 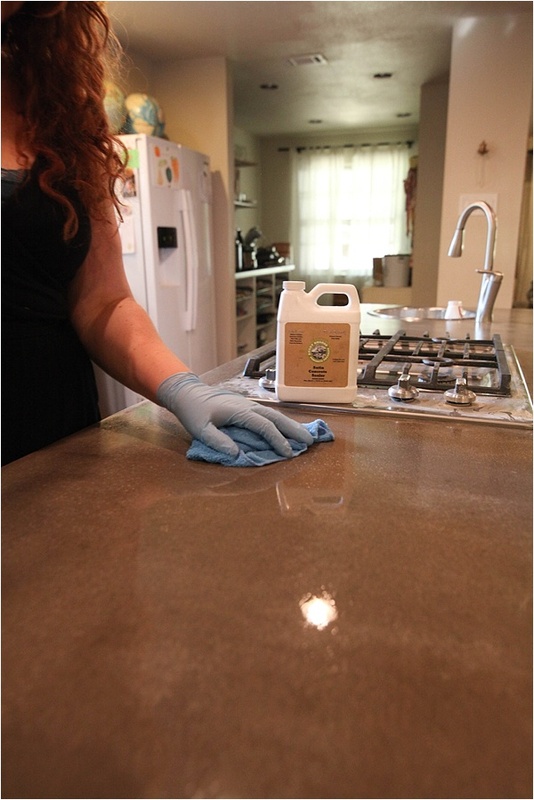 I’m so glad you were able to solve your stain problems – the countertops are drop dead gorgeous! 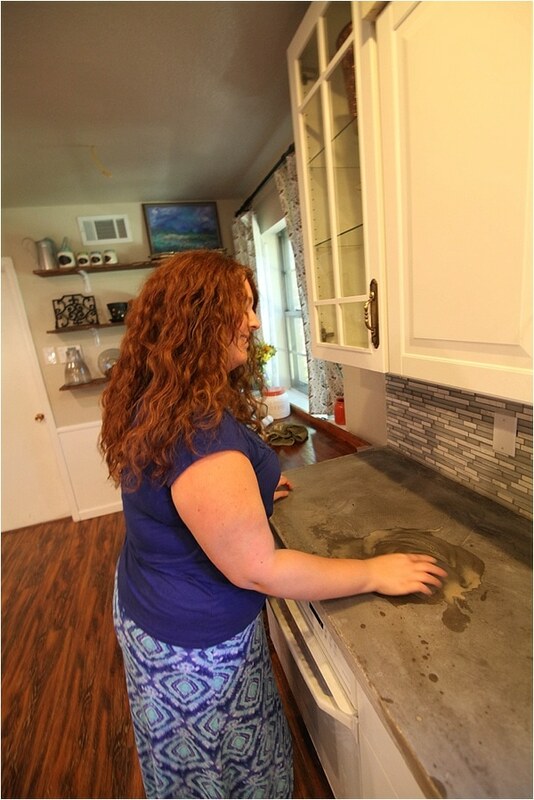 What a great story 🙂 Your countertops are gorgeous! Thanks Pearl! Yes, you should do it! They take a bit of work but I really love them! How lucky were you to run into him?? I love your countertops! 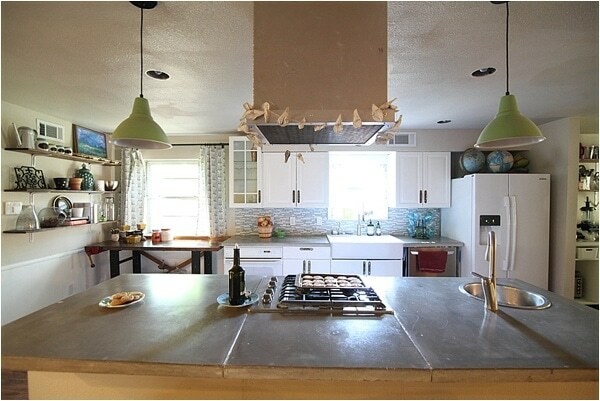 I didn’t realize that concrete counter tops could look so good. They go great with the rest of your kitchen. I was considering getting new counter tops and it can be expensive. I will have to look into concrete as an option. Thanks for sharing. What a great post! 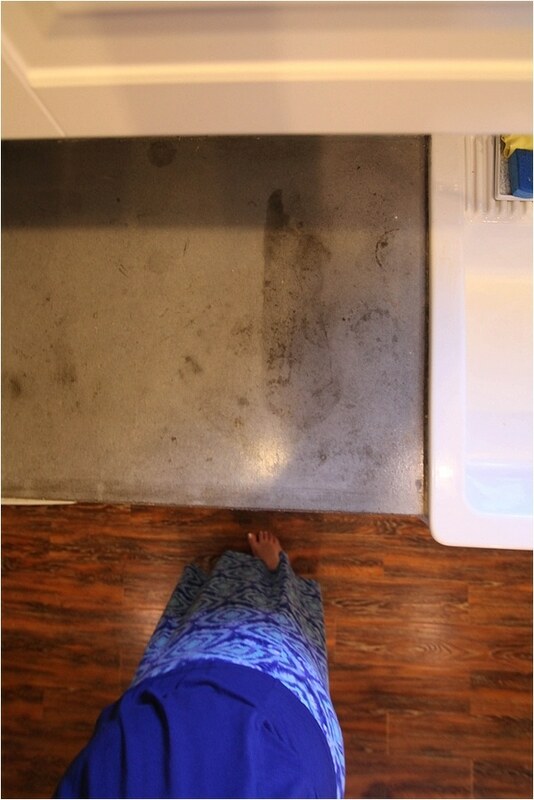 We moved into a house 3 years ago and have concrete countertops, as well as matching concrete floors. The counters are badly stained and in need of resealing. I’m happy to see your step by step, as well as knowing what products to use. Thank you for your post!! Very impressive! They came out fantastic!! My wife and I have been doing our own concrete counter job using your post for inspiration and guidance. We’re curious about something. 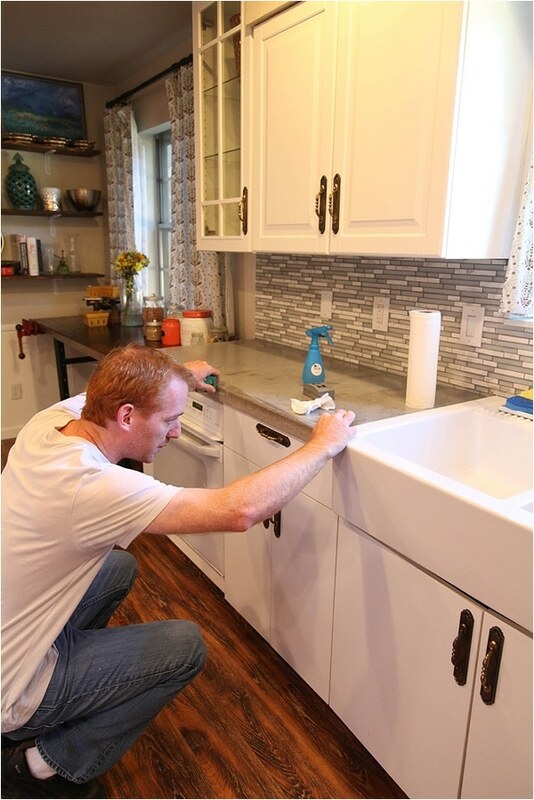 Did you do the edges of your counter or did you leave it the way it was? The idea of wet sanding sideways is making my head hurt. Hi Dave! We lightly sanded the sides of the counters using course, medium then fine sandpaper, cleaned it off really well and then sealed it. We had to put down dropcloths everywhere to catch all the drips since there’s no way to keep the mixture from running onto the floor! Love your story and counters look great! However, do you know how long this should last? I know with granite, you should seal annually. Is this the case with concrete? If so, can you keep going over your final step or do you have to start the process with removing the sealer and go through the steps? My daughter bought a house with concrete counters; there are no stains, but there are water rings. Any advise would be appreciated. 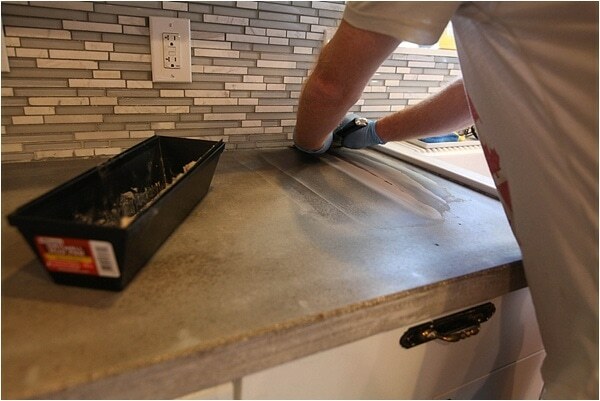 Thank you for sharing your experience with resealing your countertops. We just had professionally made concrete countertops installed and two months later they are covered in water, oil, and acid stains. We are incredibly disappointed. I have a feeling that they were not sealed correctly the first time around. Just curious, after you went through the whole process of sanding and resealing, do you have any issues with oil and acids? And are you still applying sealer every 6 months? I just moved into a home with concrete countertops with some stains, and this step by step instructions is exactly what I was looking for! What level of grit were the polishing pads? (hand and the one with the orbital sander) Thanks! We talked about doing concrete counter tops. If the up keep wasn’t so much I’d dive in. I’m still on the fence on what we’ll use. 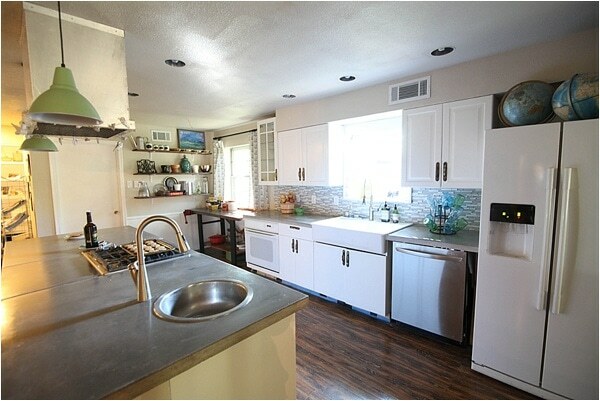 Our kitchen remodel still needs the counter tops, back splash and cabinets redone. We’ve been working on rebuilding drawers. Your kitchen looks amazing. 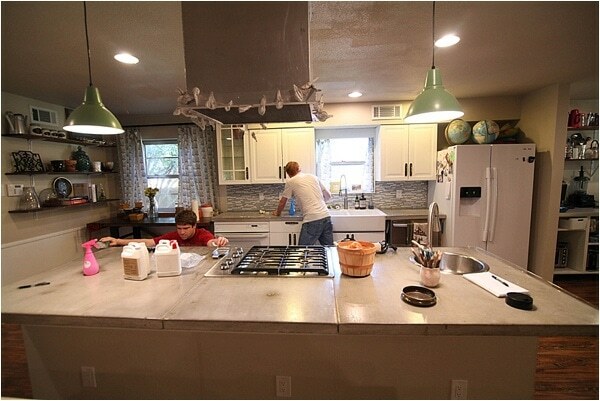 I’ve had concrete countertops for almost 7 years in my kitchen.. Mine were done by a professional, stained a dark brown and sealed well. I have not had 1 second of problems with mine. I have no stains, no pits, not anything except my work area looks a little worn and not as shiny as the other areas. 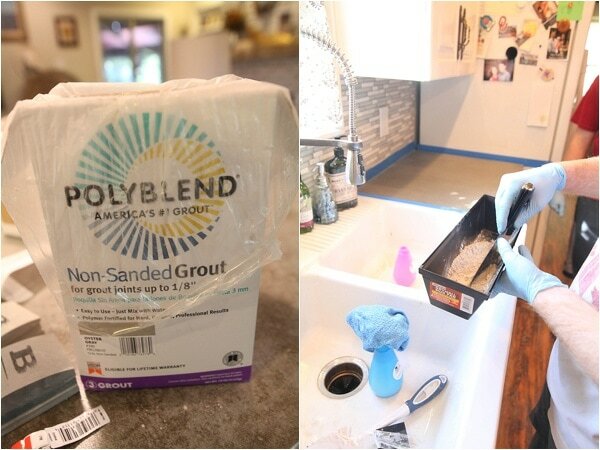 I came to this site about re-sealing just this one area that is used for everything. 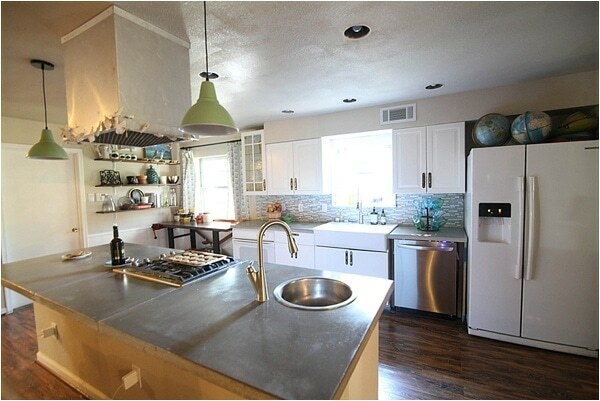 If I re-did my kitchen tomorrow, I would have concrete countertops without even thinking twice. The lady that did mine did an excellent job because they look as good as the day they were put in except my small work area. I absolutely love, love, love mine.. I wish when I re-did my house I would have put the all in one sink/countertop in my guest bathroom. I did granite instead. The granite is fine, but I like the unusual look of concrete. Everyone has granite, but very few of us have concrete. 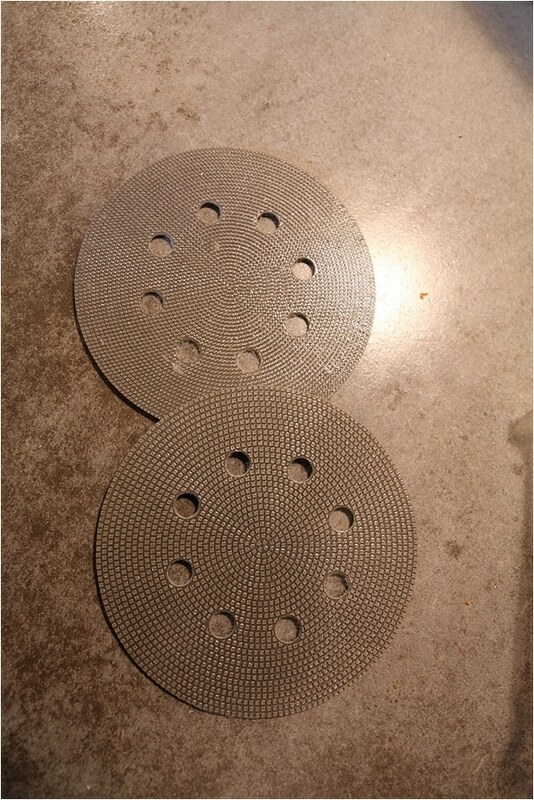 What grit sanding pads and diamond pads did you use? the rest was construction aggregate. OMG. I’ve had concrete countertops for 5 years and I have zero memory of being told that I need to seal them/re-seal them. All of a sudden they look horrendous! Everything is showing, everything! I just randomly googled the issue and also randomly hit on your link a few links down……and I live in Asheville and yes, Jeremy did my countertops. True story. I’m not sure if he is still living in the area? I seem to remember hearing he’s sold him company? Although intimidating, I’m so disappointed in how mine look (after loving them). I’m going to hunt for the products you have used and try to tackle a refinish on my own. It was really weird to see that red head in your photo’s, really..what are the chances?